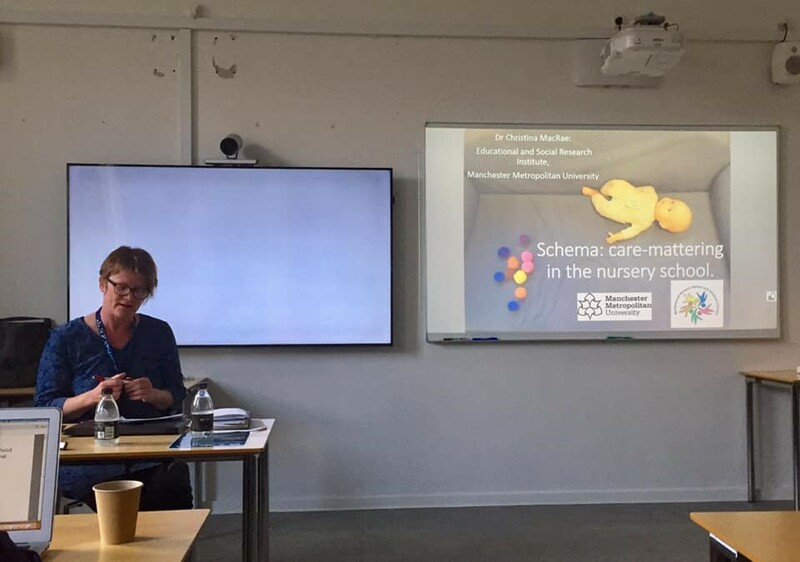 “Vibrations in place: sound and language in early childhood literacy practices” Abigail Hackett and Michael Gallagher, MMU. 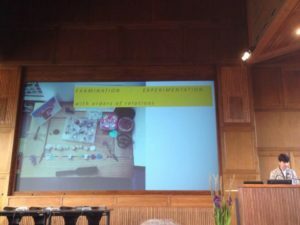 “Visual methodologies after the post-human turn: Child participatory research involving action cameras in an after-school club” Lucy Caton, MMU. “Using the virtual to explore what happens when adults “don’t talk” but instead use space, sound, materials, and bodies to converse with children?” Charlotte Arculus and Christina MacRae, MMU. It seems a shame to comment on this lovely collection of papers. I’m reluctant to arrest the flows of sense that they have released, and lock them back into the ‘fetters’  of representation that each of the presenters is so determined to resist. So I won’t comment on the papers one by one. Instead, I’ll try to tap into some of the synergies and resonances that flow through and connect the papers. I think there are strong resonances, and perhaps not surprisingly. You can tell that these papers are an expression of the shared values and interests of a genuine research collective. As a colleague of the presenters, I hover on the edges of the collective, and count myself fortunate that they sometimes let me play! But in addition to the connections and resonances, it is also important to note how each of the papers is anchored in a particular research project or intervention. It’s clear that the project is the beating heart of the matter for each of the presenters. There’s a real commitment to socially-engaged empirical research, even while each of the papers is also stretching empiricism to its limits, infusing it with theory and reanimating it with the potentialities of the virtual. It is this conjunction of faithfulness to the empirical minutiae, coupled with the embrace of open-ness and uncertainty, that assures that inquiry is both grounded in place, sensation and embodiment, and capable of taking flight and creating new spaces for thought. Let me talk briefly, then, of the resonances. Firstly, all of the papers can be identified broadly with a resistance to the dominance of conventional language. 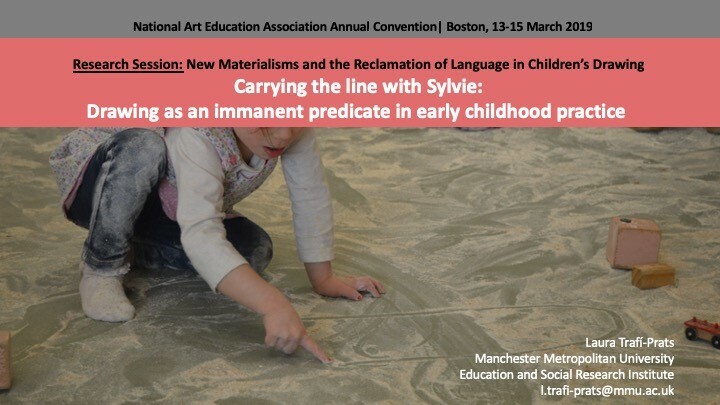 In their different ways, each paper finds language to be inadequate to an understanding of the complexities of young children’s sense-making practices. And each paper mounts a critique, explicit or implicit, of the dominance of language in qualitative research methodology. All of the papers are struggling therefore to engage with the stuff that evades ‘capture’ by language – affect, sensation, sound, gesture, movement, rhythm. The papers also testify to a certain absurdity and violence inherent in adults’ relentless mission to explain, represent, and render children and their digital adventures intelligible; to know exactly what things mean. All of the presenters are very clear that the critique of representation is an ethical undertaking. They would contend that there is an intimate and non-accidental link between the anthropocentrism inherent in representational language, and the ocular preoccupations of the professional or academic observer. They seem, to me at least, to condemn what D.A. Miller  called the ‘panoptic immunity’ of the liberal subject, who claims the prerogative to interrogate and expose the lives of others without reciprocal obligation. Kathleen Stewart  detected similar privilege in ‘the ethnographic code’. I think the presenters would say that this tends to impose an essentially colonial relation: it suppresses what is vital and energetic in more-than-human encounters, and keeps potential, change and difference in its place. All the presenters are looking therefore for resources to release, or at least tap into, that which exceeds capture and domestication by language and conventional digital methods. They pull, push and stretch language and visual media to their limits, twisting and perverting them to release some of their profane energy. They try to sense the secret rhythms picked up by cameras and video technology; to achieve a haptic vision that, in Eva Hayward’s term, apprehends with ‘fingery eyes’ ; to hear with the body and not just the ears; to acknowledge the fleshiness and the materiality of language and digital life. They are looking, in other words, for that which might deterritorialise language and open onto the new. The collective work reflected in these papers is contributing to the development of multi-sensory ethnography. 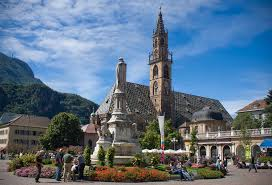 I think it is also building, or rediscovering, a synaesthetic ontology and methodology. That is, it is inventing practices of sensing – modes of attuning to the complex interplay of the senses in sensing the world. This is particularly relevant for research on early language and literacy. There is a growing body of research evidence that young children themselves make sense of the world synaesthetically: in other words, by mobilising all of their senses. This capacity declines, or goes underground, as adults learn how to enforce that brute separation between words and world, thought and feeling. The more-than-human, or non-representational orientation evidenced in these papers presents researchers with complex and paradoxical challenges. We are forced to grapple with our own human-centrism; to twist ourselves into a variety of undignified postures in the attempt to catch that which cannot be caught, glimpse things just out of the frame, or the corner of the eye, behind one’s own back; in the interstices and the accidents. We will of course fail. We will end up once more explaining, representing, orchestrating, domesticating, romanticising, judging – partly through fear of risk to children. But also because these acts are wholly implicated in what Deleuze called the dogmatic image of thought, which still largely prevails. So our artistic imagination will reassert its privileges. We will get carried away by our own rhetoric. We will be impressed by our own good and common sense and fall in love with ourselves all over again. And that ineffable sense of relationality, singularity and potentiality will fade once more. But sometimes, something will open up. And sometimes, something will get through. Deleuze, G. (1994), Difference and repetition (P. Patton, Trans. ), New York: Columbia University Press. Miller, D.A. (1988), The Novel and the Police, Berkeley and Los Angeles: University of California Press. Stewart, K. (1996), A Space on the Side of the Road, Princeton, NJ: Princeton University Press. Hayward, E. (2010). Fingeryeyes: Impressions of cup corals. Cultural Anthropology, 25(4), 577-599. Currently hosted at Monash University, you can listen to a conversation between Adam and Prof. Neil Selwyn. You can read more about Adam’s work on his personal site or the Architecture and Education blog. 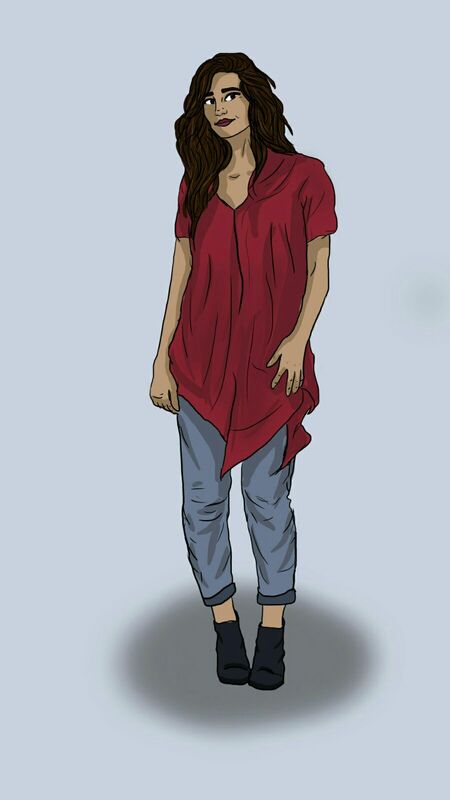 My involvement with the Loneliness Project stemmed from joining 42nd Street as a Peer Ambassador, in July 2017, halfway where the team had started the write-up of their findings and were beginning to develop the story for the immersive theatre production, Missing. Fast forward to a year later, to July 2018, me and the team received the pleasant news we had been nominated for the ‘Most Inspiring Campaign’ at the Spirit of Manchester Awards ceremony to be held in October. Consequently, this would fall within the same week that I would be asked by the BBC to speak on Radio 5 regarding the experiences of youth loneliness and how youth are able (or not able) to support themselves. I arrived at Media City just in time for my appearance on the show, as it was my first time in the studio, I was not aware one had to wear headphones. At precisely 8.04am, the producer was showing with her hands, what I was to do. I spoke to a man earlier who said loneliness meant he stayed at home and didn’t leave, is this something you can relate to. Though this is the image perceived in one’s mind, in fact, I enjoy my time at home. I expressed to the radio presenter that loneliness for young people, exhibits during school hours, during holiday season, and surrounded by family and friends. The research is truly vital for voicing this issue in our society as young people are the future. There needs to be more initiatives to encourage young people to speak up about their feelings of loneliness, to encourage social media detoxes and to develop community work. I left the Studios feeling slightly sad, my feelings stemmed from the reality that, though I was able to contribute to this amazing research, there are still many young people who do not have access to community spaces for young people such as there are for me and many others in major cities such as Manchester, Birmingham, London. Anyways, I was on the way to work and around 11am, I recieved a call from James from 42nd Street, who said that there’s a journalist who wants to speak to you about the research, it will be aired at 12.45 pm that day on Newsbeat. The journalist, Gurvinder, had stated that this would be pre-recorded and she asked me questions, similar to the morning interview around my personal experiences of loneliness. Again, I was not sure if what I was saying made any sense, but I had simply expressed that young people need not be afraid of being alone. It is a chance to invest in yourself. I started to learn German during a summer, between my A-Levels. The project is immensely important to me, and I am grateful to hear that the BBC had commissioned their own research and found that levels of loneliness are higher in younger people with 40% feeling lonely, compared with only 27% of over 75s. Janet Batsleer and Jenny Hughes have a long standing Manchester-based collaboration and interest in the ways applied theatre and critical street based and community projects collide, cooperate and unsettle both welfare and arts practice. In this session, Janet will invite Jenny Hughes to talk about how she used theatre as a research method in the recent Poor Theatres project. 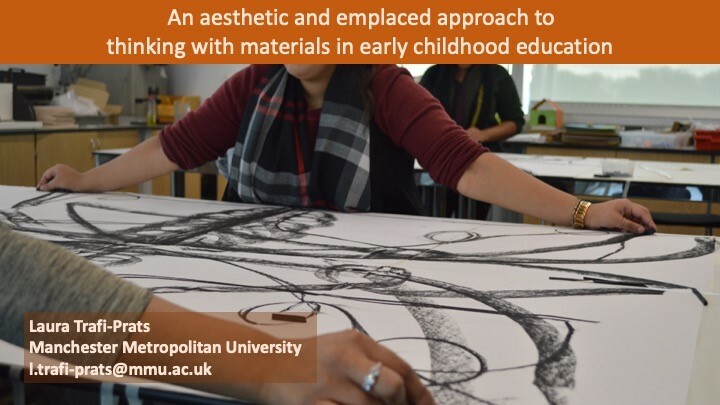 This AHRC funded project explores the concept of ‘Odd’ through an interdisciplinary lens that includes art practice and new materialism, drawing on site specific creative co-productive work in schools with teachers and young people. One initial project has worked with the idea of ‘Odd boxes’ and has involved re-imagining the idea of ‘Odd’ from the point of young people. In this presentation, we discuss the intersection between co-production, theoretically driven research and practice-oriented approaches to consider the possibilities of ‘Odd’ research within the academy and beyond. We engage with the different traditions of research, from artistic methodologies including practice-as-research, residency-as-method to participatory modes of inquiry with children and young people. 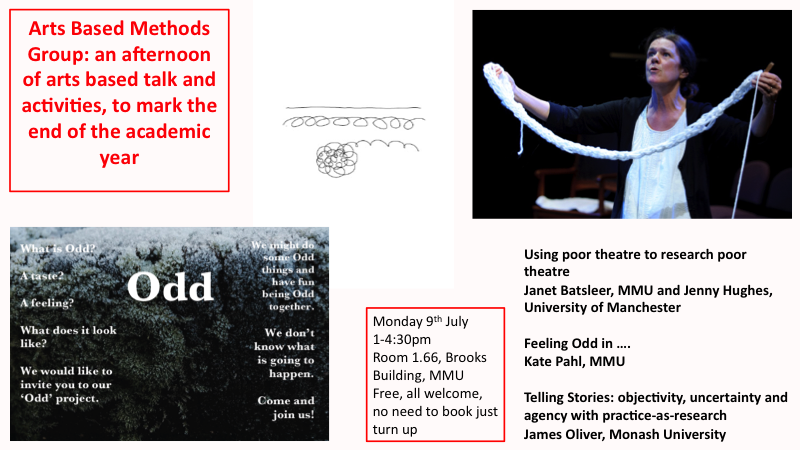 The ‘Odd’ project throws up issues of voice, feeling, affect and collaborative inquiry, all key areas for arts-based research and wonders what it is like to be ‘Odd’ in the world of research. This workshop (or interactive seminar) is focussed on our ‘methodological’ imagination and the formations (or relationality/praxis) of methodology as content. Participants should bring with them an object (or ‘thing’) that in some manner pertains to their research practice, research situation or research identity. This ‘thing’ will be used to develop a story on objectivity and agency for the participants. For more information refer to the arts-based methods website. The epidemic of loneliness. The lack of human contacts is as dangerous as high blood pressure or extreme overweight. What can Sweden learn from a small British city, where it managed to stop the epidemic? Program leader: Lena Scherman and Bengt Norborg. Part 10 of 10. Academics from ESRI presented their research last month at the 2018 AERA conference in New York. The overall theme of the conference was ‘The Dreams, Possibilities, and Necessity of Public Education’, and with over 17,000 attendees, the annual conference is organised around a number of Divisions, Sections and Special Interest Groups (SIGs). 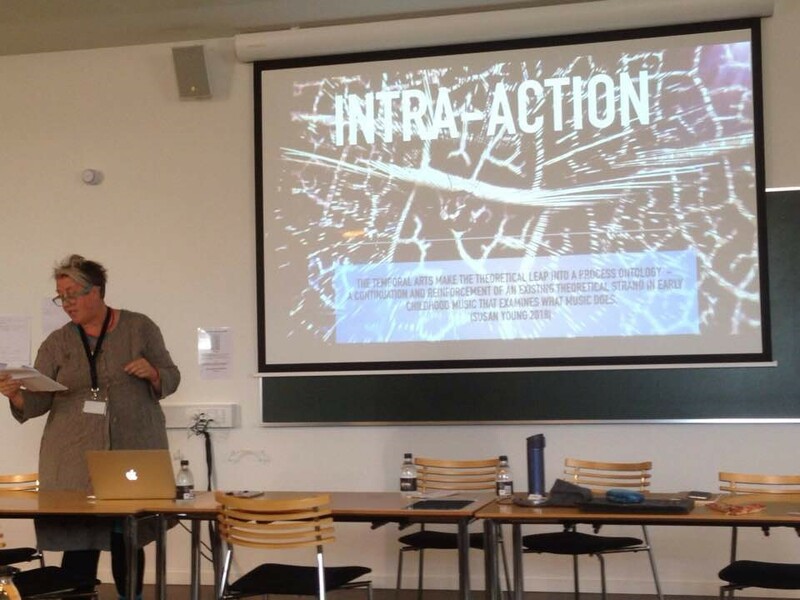 David Menendez Alvarez-Hevia and Karen Pashby presented (on behalf of co-authors Edda Sant and Jane McDonnell) “Agonistic Controversial” Issues as a Pedagogy for Global Citizenship Education“, within the Democratic Citizenship and Education Special Interest Group. The paper described findings of research workshops aimed to generate an agonistic space in which ideas on global citizenship were discussed without seeking consensus. 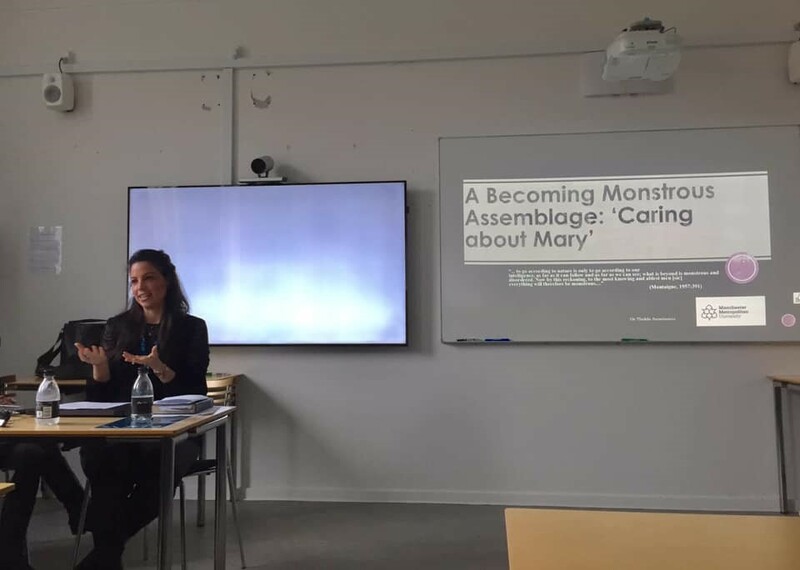 Karen Pashby also presented (on behalf of co-author Louise Sund of Malardalen University) ‘Rethinking Teaching Sustainability and Global Ethics for U.N. Sustainable Development Goal Target 4.7: Engaging Swedish Upper Secondary Teachers’. 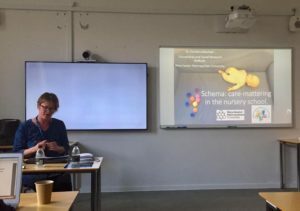 Liz de Freitas presented a paper ‘Dyscalculia, neuroscience and time: Rethinking the biopolitics of the body’ (on behalf of co-author Nathalie Sinclair), within the Disability Studies in Education SIG. David Rousell presented three papers in the Environmental Education SIG. 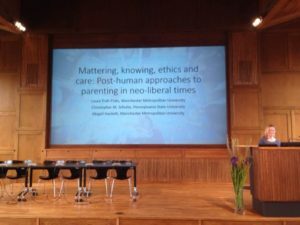 His papers were titled Creatures of Experience: Towards an ecological aesthetics of childhood in an age of climate change (w/ Amy Cutter-Mackenzie). Ecological Aesthetics: New spaces, directions, and potentials (w/ Dilafruz Williams); and The ChildhoodNature Companion: Art, writing and research by children and young people (w/ Joshua Russell). Sarah Truman presented in four sessions across various Special Interest Groups including: ‘Inhuman Literacies’ in Division B; ‘Racial Ontologies and the New Materialisms’ in the Qualitative Research SIG; ‘Walking methodologies in a more-than-human world’ in the Qualitative Research SIG; and ‘Public Pedagogies and the Arts’ in the Arts-Based Educational Research SIG. 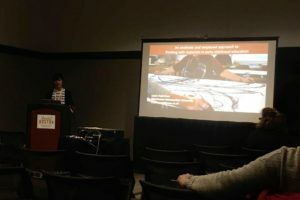 (Sarah’s attendance at AERA was funded by the Social Sciences and Humanities Research Council of Canada, and WalkingLab.) Also as part of the symposium ‘Walking methodologies in a more-than-human world‘, Michael Gallagher presented ‘Sound beyond meaning: listening walks as pedagogy‘ on behalf of my co-authors Jonathan Prior, Martin Needham and Rachel Holmes. 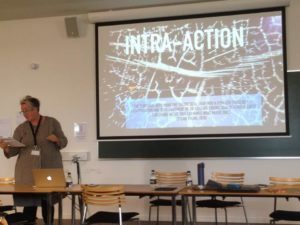 Kate Pahl convened a symposium on ‘Rethinking Literacy Ontologies Through the Eyes of Participants, Objects, and Sites: Public Pedagogies of Possibility’. This was part of the Writing and Literacies Special Interest Group. As part of this symposium. Kate Pahl and Hugh Escott gave a paper on ‘Prescriptivism and Inhuman Literacies: Rethinking Language and Schooling for Public Pedagogies’. 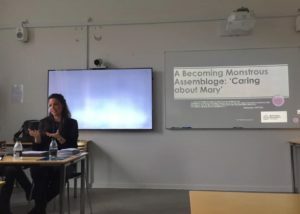 Christina MacRae also presented in this panel her paper called ‘Colliding bodies and vibrant objects’, uses Harraway’s notion of ‘tentacular’ thinking to explore ‘object conflict’ in a class of two-year olds. 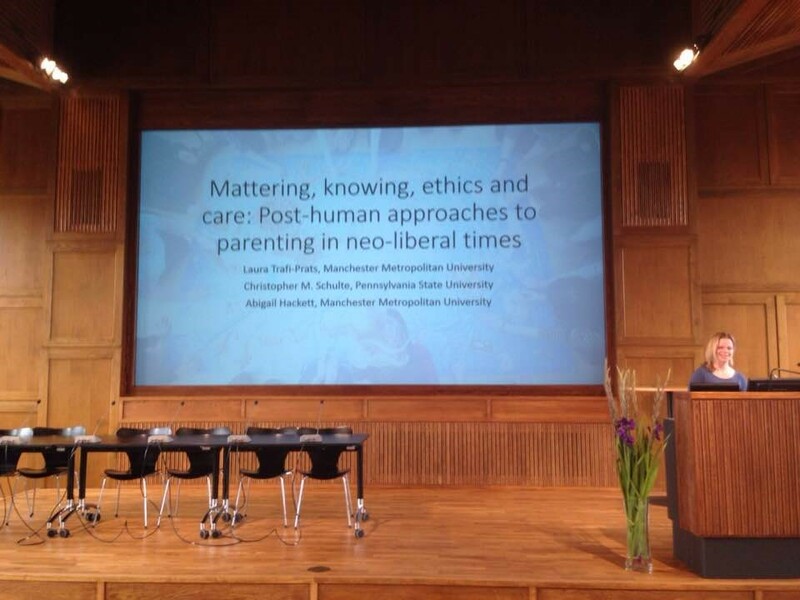 Finally, also in this symposium Abigail Hackett and Pauliina Rautio presented ‘Corresponding with the world as early childhood literacy ontology’, in which they offered a new orientation for early childhood literacy, away from mastery of and naming of the world towards a deepened entanglement with the more-than-human. “It was my first AERA and I found it extremely enriching and overwhelming. I had the opportunity to attend to some presentations that provided me with a flavour of some of the main trends, concerns and interest in educational research in the context of USA. It allowed me to come out of the “UK-European bubble”. “I was immensely proud of the breadth of ESRI’s research represented at AERA and the world-leading nature of the papers. As Head of ESRI it is a privilege to witness my colleagues’ amazing work”.